译术论坛杂志期刊书籍资料库Sky & Telescope-June 2014 USA88 Pages|True PDF|English|16 MB Sky & Telescope magazine has been the complete resource for amateur astronomers for o ...amateur astronomers,sky,magazine,杂志,宇宙Sky & Telescope-June 2014 USA - Powered by Discuz! 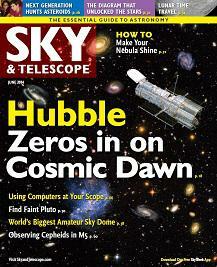 Sky & Telescope magazine has been the complete resource for amateur astronomers for over 60 years. It provides readers with information on observing the sky, offering reviews and buyer's guide information on the latest products, as well as tips, how-to's and much more. GMT+8, 2019-4-20 05:10 , Processed in 0.347805 second(s), 40 queries .